Have you always wanted to host a party or simple get-together in your living room but worried that your interior design is not the right fit? Your living room is a space full of entertainment possibilities. With simple design tricks, you can create a warm and inviting space that’s great for entertaining. Transform your living room and be the perfect host with these 11 fantastic design ideas. When it comes to living room design, proper lighting is of paramount importance. Sticking solely to your condo’s pre-installed fluorescent lighting is a serious design mistake. Proper lighting can set the mood for your living room. And you wouldn’t want it to feel like a grocery or a factory with all the glaring lights. Illuminate your space with softer lighting using floor and desk lamps. It’s also effective to add natural lighting to your space by opening windows and installing curtains. All these can create a flattering and warmer effect perfect for entertaining. Having a clutter-free condo design is non-negotiable. Installing a functional yet classic living room shelf serves a dual purpose: it’s both a storage space and a design element. Generously divide your shelf so you can add decorative pieces. Also, maximize the wall space by having a shelf that runs high up the wall. Ready-made and do-it-yourself shelves are great, but you can also consider splurging a little to have something custom-made for your space. Throwing kiddie parties is a happy aspect of condo living. There is, of course, the pool area where the kids can go for a swim. But with all their energy and the unpredictable weather, it’s important to create a kid-friendly environment in your condo living room. Having a smart table compartment for kiddie toys is awesome because of the easy storage it offers. Even with limited space, this furniture helps encourage the creative and learning needs of both your kids and their guests. An entertainment design should follow the rule of proportionality. Determine the size of your living room when choosing the perfect furniture and accessories. You want something that fits, instead of making the space cramped or bare. Always think about the scale. For example, pair your couch with an appropriately-sized table to make them compatible. 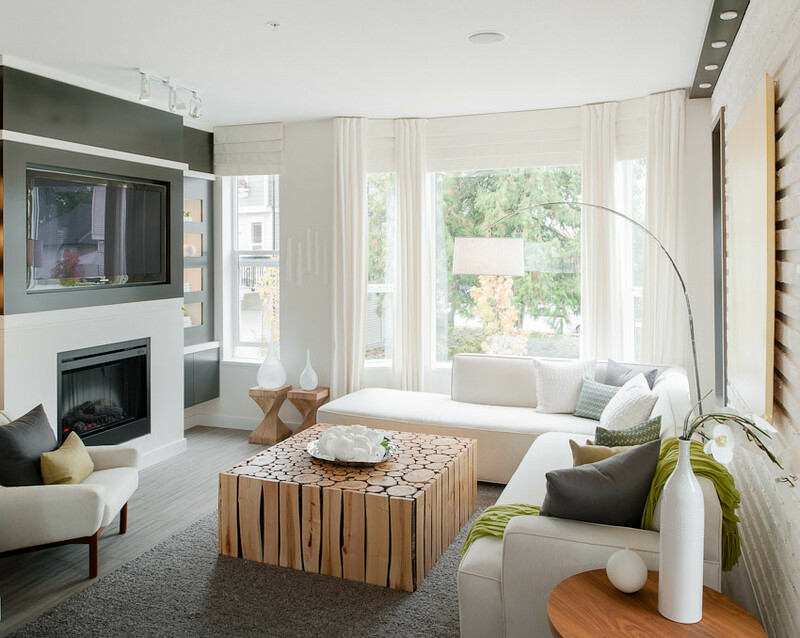 Making sure about proportions is one of the best design tricks for small condos to make it look more spacious and comfortable for entertaining. Adding conversation pieces to your space will make it great for entertaining. If you want to impress your guest a little, think outside the box when it comes to unique furnitures. It’s totally fine to unleash your eclectic taste when selecting certain pieces, like a table made of recycled wood. Feel free to also use different materials such as glass, leather or hard plastic. Placing nontraditional pieces in your living room will make it visually interesting for your guests. “Mirror, mirror on the wall, who’s the fairest of them all?” Perhaps using this line from a fairy tale can drive home the point that mirrors can make your living room dreamy and beautiful. Mirrors also serve a functional role: they can make your space look bigger. Adding design pieces with a touch of silver can bring the royal look together. With dimension and sparkly design, your living room sure can feel great for entertaining your important guests. Parties can be so much fun that they can extend up to the wee hours. Whether you’re inviting your best friend or family, having a convertible sofa allows you to provide a sleeping area for those late-night parties. It’s a good investment, especially if you don’t have an extra bedroom in your condo. It’s also great for those days when you need a quick nap in the afternoon. Choose a convertible bed that’s the right size for your space. You may also consider choosing a cover that’s easy to wash and dry, such as cotton and canvas. You want an entertainment space that looks alive, not drab. Add plants to make your living room a breathing space. Whether it’s a flower pot or rustic plant, showcasing your plants in the living room can make your space serene and calming. It’s great for those afternoon tea sessions or a heart-to-heart conversation with your friend. Plants are also wonderful alternatives to expensive and often unattractive air purifiers. They make your living room exude a tropical and relaxing vibe while taking care of the indoor air for you and your guests. Entertainment living room ideas won’t be complete without having a dedicated TV and gaming corner. Having an entertainment-worthy living room is about creating a comfortable and enabling space. Having a flat-screen TV will save you space, while serving as a stylish device for better movie viewing and gaming experience. With a TV and gaming corner, you can host a game or movie night instead of going out. Adding a plush sofa makes sure that everyone will be comfortably seated. Many workout routines have lately become an effective means for health and entertainment. Think Zumba and workout videos. Because workout routines can be fun and engaging, more and more people transform these healthy activities as a bonding activity with friends and family. Adding a simple fitness equipment to your living room not only makes your space exude an energetic vibe, it will also easily allow you to host a fitness session. Working out in your living room with friends and family is a great activity that’s good for your health and relationship. Creating an entertainment-ready living room for you and your guests is easily achievable with these 11 design tips. Remember that you already have the space, and it’s just a matter of tweaking it for hosting great parties and group activities. Employing these tips will help you create the perfect living room design that combines style and functionality.